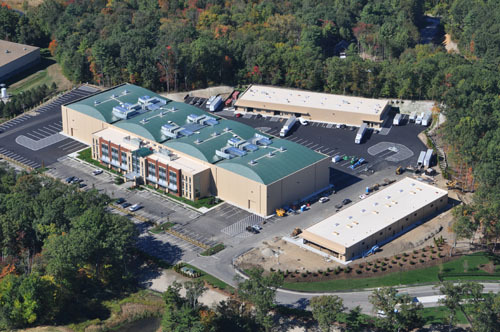 Aerial view of the recently completed New England Studios complex on Devens. Massachusetts has taken a big step closer to becoming the film-making mecca of the Eastern U.S. – and that means a potential boon for the area. New England Studios, with sound and film stage capacity and equipment to attract big names, world-class projects, and jobs to its surrounding towns , recently opened on the grounds of the former Fort Devens. Built on 15 acres, at an estimated cost of $60 million, NE Studios “unofficially” opened in October to public viewing, according to Marketing Director Chris Byers. Four 18,000-sq. ft. sound stages anchor the full-service television and film facility. Other features include 24-hour gated security and video surveillance; drive-on stages; two 20′ x 20′, exterior “elephant doors’ for hauling in large equipment and sets; a complete fiber optic network throughout the complex; and a 30,000 sq. ft. office building. Not only does NE Studios house all of the features demanded by California-based producers, but Byers maintained it surpasses many, making it one of the most comprehensive studios in the world. It also offers features not found in many of the established West Coast studios. For instance, NE Studios’ ability to totally close off one of its studios from another for privacy may seem like a given. But, Byers noted, “It’s not like that in most studios. Most of the California stages were developed 70, 80, 90 years ago.” Clients also can combine studios into several configurations, if needed. It appears NE Studios likely will produce more than entertainment. “If a television series comes in, they have 120 to 180 jobs available, depending on the type of show,” Byers said. He added that a TV show or film heavy on special effects could call for 400 to 600 jobs. NE Studios will have an upper hand in competing for projects with established production cities such as New York City and Montreal, Byers maintained. “New York is very expensive to shoot in, and Canada is out of the country,” he pointed out. Another incentive NE Studios is banking on to bring in business is some substantial tax credits. These include 25% credits on production expenses and payroll, plus a sales tax exemption, to qualifying projects, according to the MA Film Office. Though Byers reported that several potential clients are in negotiations with the company, he stressed he legally is prevented from naming them until any contracts are set. Currently, Byers expects to be able to announce some projects by January.